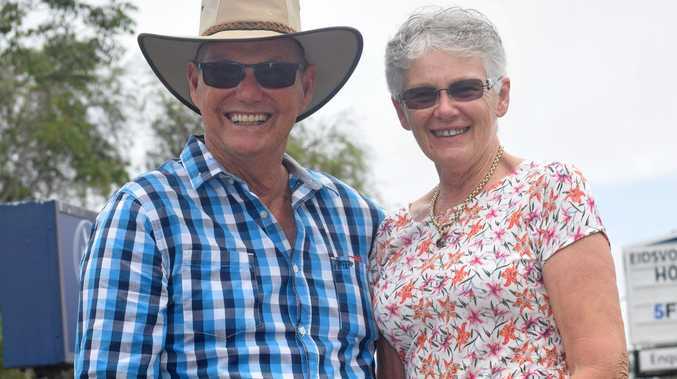 GREY NOMADS Betty and Ian Jones from Brisbane travelled all the way to Eidsvold for the historic Eidsvold Charity Cattle Drive that concluded on Saturday afternoon. The pair said it was a lifetime experience getting to see the cattle crossing the bridge. "It was exciting to see this mob of cattle coming towards you, and the drovers sort of shaping them in,” Mrs Jones said. "It's something you don't see, it's good to see the young people coming through and taking part in the cattle drive,” she said. More than 530 head of cattle crossed the Burnett River and into the Eidsvold Saleyards just after 1pm. The cattle crossed the Eidsvold Station Bridge around 8:15am and headed towards the Eidsvold hospital where onlookers gathered, to see the historic event unravel. "It was a great experience,” Mr Gitsham said. Mr Gitsham said the drovers went through a lot of different country over the past six days. "You meet people of all different walks of life,” he said. "It's wonderful to be here to see the cattle drive,” he said. "When you see the cattle crossing, it just brings back memories of how we used to do it. Organiser Viv Hutchinson said the cattle drive was a huge success. "It went brilliantly,” she said. Mrs Hutchinson said the 25 paying customers have received an unforgettable experience. "They're bringing their mates, they are overwhelmed with our bush hospitality and friendliness,” she said. Mrs Hutchinson said a crowd is now forming at the Eidsvold showgrounds ready for the Burnett Buckle to commence. "We're starting to get a crowd in at the showgrounds, they're setting up in the ring now, we have the poddy rides starting at 6pm, followed by the rodeo at 6:30pm.